I needed Mario Kart 8 in my life, even though I didn’t know it. It’s been just over six years since Nintendo last released a console version of their flagship racing game for the Wii, a version that socialized winning the game by flinging Blue Shells and Lightning Bolts at me so frequently I was constantly one wrist-strap away from smashing a controller against my wall. I wasn’t sure the series would ever recover and focused on playing the hand-held versions, with the idea of more couch-side Mario Kart fading from possibility into pure nostalgia. Out of seemingly nowhere, on an inarguably floundering console, Mario Kart8 has drifted into view like an old friend back in town and delivers the kind of great time I thought was forever resigned to the past. If you’ve played a Mario Kart, you’ve more or less played Mario Kart 8. Nintendo opts to keep the formula for the game—race on karts or cycles, get items, have fun, make your friends mad—basically untouched. Sure, there’s a new “looks great in video clips” feature where your kart’s wheels flip horizontally, Back To The Future style, into a hover mode, clinging to walls and ceilings. 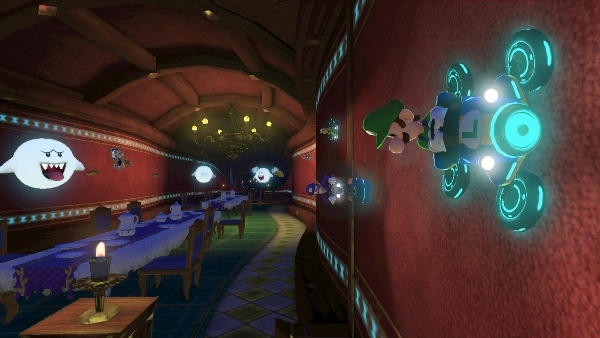 It’s a neat trick, but doesn’t change the way you play the game—when you’re upside down, the game makes sure you feel right-side up, probably to avoid players getting sick all over their GamePad. All this vertical driving exists to unshackle the people making the courses, and they use it to turn what could be flat terrain into beautiful Möbius strips. This is all good news—racing in Mario Kart is already so much fun, and when the “big new thing” stays out of the way of playing the game and adds a lot of spectacle, it’s a huge plus. Mario Kart 8 looks good and clearly knows it. To be honest I’m still a little impressed seeing these characters in HD after 7 years of Wii games, but like most first-party Nintendo titles, Mario Kart 8 flaunts every visual trick the Wii U’s got in it. All the characters have individual, adorable animations which breathe life into the race. All the environments are bright and colorful, even the haunted mansion and supposedly dingy dungeon. You’re tearing through a non-existent theme park, throwing each other over the railings and it looks great while you’re doing it. A new feature called Mario Kart TV lets you cut together detailed highlight reels of your races, letting you rewind and play them in slow-motion, even setting what you want the highlight reel to focus on. These can also be posted onto YouTube or the MiiVerse, as Nintendo takes its first baby steps towards embracing the world of live streaming. There’s a surprising amount of things to do online, for a Nintendo game. Mario Kart 8 features all the modes from the offline game, though courses are selected one at a time by the group, rather than organized by “Cups.” If you don’t trust the mob and want more control over what you play, the game offers fully configurable Tournaments, which let you micromanage the heck out of a series of courses. Want to play 100ccs, no shells, motion-controlled motorcycles only? Good luck getting me to play it, but go nuts. Mario Kart 8 doesn’t get much wrong, and its shortcomings, both online and locally, come down to what’s missing. There’s no voice-chat for players during races, and even in lobbies you can only talk to friends. And while Nintendo looks to be catching up with its competition with these online features, there’s nothing in the game to indicate you’ll be able to buy more courses or drivers—things that I’d pay a premium for in order to get some extra life out of the game. Courses, too, feel shorted in the series’ previously excellent Versus Mode. Earlier Mario Karts would have you face off in specialty arenas, the series’ balloon-bursting version of Thunderdome. 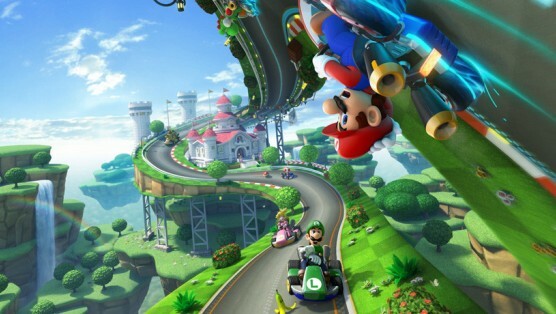 Mario Kart 8 keeps the balloons, but drops you into the existing courses. In the sprawl and loop of the standard racetrack, something exciting is lost, and it’s a shame. The other notable omission is in the cast of characters’ diversity. After 30 years there are still zero Mario characters of color, a problem that Mario Kart 8 highlights by lining up all the characters on a single screen. When it comes to human characters, Mario Kart 8 is overwhelmingly white. Of the 29 drivers, 14 are human (including Toad and Toadette), and every single one of them is white. While it’d be atypical of Nintendo to introduce new characters into a Mario Kart game, it’s also where the deficit is the most obvious, and during play I found myself disappointed that Nintendo’s stable of characters so painfully fails to reflect the diversity of its audience. Despite these omissions, as glaring as the last one is, Mario Kart 8 brings back a type of game long absent from my living room. Sure, there are new power-ups to play with and new tricks, like dodging red shells, to learn, and it’d be nice if there were more courses. That all falls away, though, as the core of Mario Kart 8 delivers exactly what I wanted—a return to the “friends screaming at each other, red-spark generating, mercilessly hitting-each-other-with-shells” action that made the series fun from the start. Casey Malone is a game designer, comedian and freelance writer living in Boston. He has dibs on Shyguy, please respect the rule of dibs, thank you. Follow him on Twitter @CaseyMalone.